Whether you’re supporting the most popular brick-and-mortar technologies (Point-of-Sales, card readers, network peripherals, etc.) at merchant locations all over the world or merely supporting the operations of a small organization, there is nothing more valuable than a well-structured knowledge base integrated with the right chatbots. The easier it is for everyone to access the knowledge they need, the more powerful the results. Think of a knowledge base as a central repository for all historical and present information related to your organization. This central point of knowledge is a place where employees can contribute and gain access to information that is critical to your organization’s success. Issue resolution notes, lessons learned, contact information, rules and procedures, answers to FAQs, etc. are all perfect examples of knowledge base-worthy content. By utilizing a knowledge base, your organization can operate more efficiently and scale faster by automating the way employees get solutions to their most common pain points. A knowledge base can also help to lessen the collateral damage when an experienced employee leaves your organization by allowing the rest of the company to have continued access to any knowledge that now ex-employee previously contributed to the knowledge base. Typically, knowledge base information is accessible via search bars similar to Google or via a visual hierarchy of folders. In most cases, users opt for the more powerful and faster search bar UI. Text-based chatting has become an incredibly popular channel of communication both at the workplace and in our everyday lives. We text our closest friends to stay in touch and make plans, communicate with coworkers via email and HipChat, and can even order a pizza by simply tweeting an emoji. Text-based chat isn’t going anywhere. In fact, it’s just about to take off and revolutionize our lives even more with the addition of automated AI-assisted chatbots. When integrated with the right knowledge base, chatbots can allow members of your organization to seamlessly access the information they need to be successful by simply chatting like they’re already accustomed. No need to build out these chatbots either. When they’re completely integrated with a knowledge base you simply need to add a piece of information to the knowledge base, give it some keyword tags for the machine learning (ML) and artificial intelligence (AI) to look for, and categorize it. That piece of knowledge will now be accessible via the knowledge base UI and chatbots that live in your organization’s most highly trafficked communication portals. 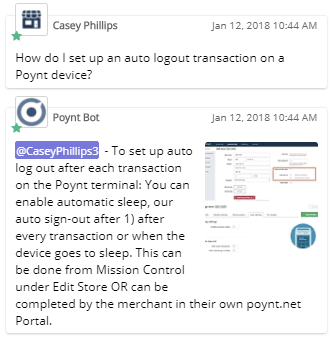 The Relay Poynt Knowledge Bot uses ML and AI to properly respond by looking for certain keywords in the user’s message. At Relay, we’re working towards this goal of seamless integration between organizational knowledge bases and chatbots. We understand just how vital timely knowledge can be in a tense troubleshooting environment where mere seconds are crucial to success. With Relay, your support team will always have the knowledge it needs at the tip of its fingers. Have you used the Relay chatbots yet? If not, we’d love to give you a demo and show just how powerful their impact can be on your support offering. If you have used our chatbots already, we’d gladly welcome any feedback you may have.